Green Farm is an innovative way of indoor hydroponic cultivation of vegetables and herbs: a healthy, clean and aesthetic way for you to enjoy home-grown crops. Home-gardening is quite en vogue nowadays - alongside the "grow your own food" trend. Unfortunately, not all eco-ethusiasts possess the time, skill and space necessary to start their own gardens. Does it mean they need to make a choice between family and work - and their hobbies? Will the dirt-covered, sad looking winter lettuce from a local supermarket be their only source of fresh food? Green Farm offers a perfect solution to this dilemma. a fun way of spending time with family and friends, without giving up your interests and hobbies. 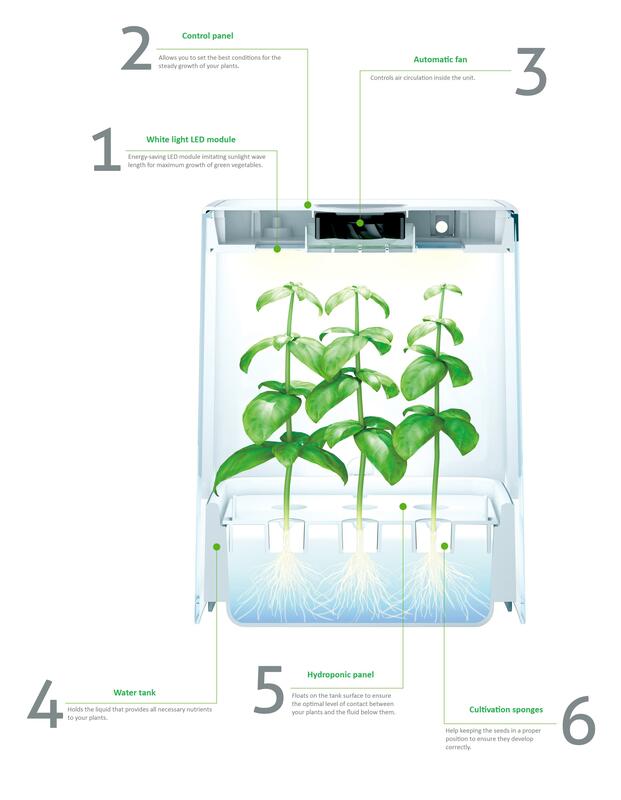 Green Farm is a unique product on the European market: a complete, energy saving hydroponic set for indoor cultivation of leafy vegetables and herbs. Its convenient size, aesthetically pleasing design and intuitive operating system are but few of the many features that had endeared Green Farm to the quality-seeking consumers in Japan. Now it is time for Europe to discover all of its merits..
You have neither the time nor the space to start up your own garden. You have in your care small children or people suffering from food allergies. You worry about your family's health and safety. You're looking for a way to keep herbs and vegetables used in your workplace tasty and fresh. You wish to grow your own herbs and vegetables at home. and various herbs: in other words, the greens that inspire the biggest freshness-related doubts when you buy them at a supermarket. Every day, you find yourself face to face with difficult decisions. Let Green Farm help you choose what you eat. in conjuction with ventilation system and a water pump make Green Farm a fully functioning hydroponic set, virtually independent of outside weather conditions. Green Farm will continue to work in accordance with the pre-input parameters until the crops are ready to be harvested. is a plant cultivation method that uses liquid instead of soil as base for growth, making it a perfect solution for gardening afficionados who have no access to a gardening plot, or wish to grow vegetables that don't contain mould spores, parasites etc. allows the user to place small pots of flowers or herbs inside the Green Farm set when leaving for a longer holiday or business trip, to ensure that they receive a proper amount of water and sunlight in the meantime. Green Farm is a complete, ready-to-use hydroponic set designed for home gardening purposes. Once you've chosen your preferred type of vegetable to plant, the preparations take but a few minutes! What can I plant in Green Farm? All leafy greens: Chinese pak choy cabbage, endive, arugula, baby leaf spinach, assorted lettuces and herbs. All these plants have shown good compatibility with hydroponic cultivation; moreover, these are precisely the vegetables which, when bought out of season, could carry the greatest amount of fertilizers and artificial enhancers. When choosing your seeds, be careful to check the best before date. The seeds of leafy greens, especially lettuces, usually grow old rather fast: and the older the seed, the less chance there is of it sprouting and growing into a healthy plant. After unpacking the equipment, wash all the plastic elements (by hand or in a dishwasher), and assemble them according to the instructions listed in the manual. ( Check the "Operations Manual" tab for details.) It's a fairly stragithforward task, which should take approximately 10 minutes. A start-up set of sponges is included in your Green Farm set, their number sufficient for a full cultivation. Before planting the seeds, soak the sponges thoroughly in water and squeeze them a few times to remove all oxygen particles. While the sponges are soaking, prepare the hydroponic fluid for your plants nutrition: use cool tap water, and add the lowest prescribed amount of of your preferred mineral fertilizer with Calcium. We're not going to suggest any specific brand of fertilizer: as long as it contains Nitrogen, Phosphorus and Potassium, along with microelements, it should be sufficient for your purposes. We do not, however, recommend using any organic fertilizers - you can find out about why is it so from our blog post on the topic. Try to keep your nitrogen content as low as possible; lower even than the dose suggested by the manufacturer. It will help keep your vegetables free of any nitrogen derivatives. When the water and fertilizer are mixed, pour the liquid into the tank while keeping an eye on the floater in the corner: once the blue line becomes visible over the surface, you've achieved the volume that should sustain your plants for a full growth cycle. Still, it's better to check on the floater level every few days (especially if it's hot, or the plants have grown substantially). Next, place the hydroponic panel gently inside the case: it should float on the surface of the liquid. You're ready to go! How do I plant the seeds? Place the soaked-up sponges (and caps) in the holes of your hydroponic panel in a pattern you prefer. You might want to start by planting as many seeds as possible, and using no caps at all, in case not all of the seeds sprout. You can always remove some of the weaker plants later on if need be. Make sure that the sponges are half-submerged in the fluid - you should be able to see a bit of liquid inside the sponge. Place 1-2 seeds on each sponge, preferably without touching them: an unbent paper clip or a needle might help you move the seeds if you moisten the tip a little. When you're done placing the seeds, close any unused holes off with the caps provided, to help stop the algae growth. Please note that algae appearing in the tank or on the surface of your sponges is a perfectly natural occurence and will not inhibit your plants growth in any way. Next, push the hydroponic tank gently into the Green Farm case, and close the door. All that's left to do now is press the "Power" button. First 3 days are for the seeds to absorb the nutrients and start sprouting: which is why the LED lights are off at this stage. When they turn on after 72 hours, you will be able to see the results of your hard work. After 10 days, check on your plants' progress. Now's the time to remove any weak seedlings, or seeds that haven't sprouted: simply remove the sponge, and close the hole with a plastic cap. You can also change the placement of the seedlings to give them a little more space as they grow. You can start partial harvest after approximately 21 days after planting the seeds, but the plants will be fully grown after a full month. Check on their progress every few days, and be the judge of whether to leave them for a while longer, or start cutting the leaves off now. Start from the outside, lower level leaves, and save a 1 cm piece of leaf over the sponge: it will stimulate the plant to keep growing. Now, call your family and friends and serve them a salad from your own home garden! Bon appetit! What's the size of a Green Farm set? L 544mm, W 262mm, H 305mm. Where can I put my Green Farm? As long as it's indoors, with room temperature between 15 to 30 degrees Celsius - anywhere you like! Please remember to avoid high humidity places, or putting your Green Farm right under an AC unit, and make sure you put it on a flat, stable surface. What type of seeds and fertilizers should I use? Again: we're encouraging you to experiment, and choose from the wide range of seeds available in the market. As for the fertilizers, please refer to this post on our Tumblr blog for inspiration. How much energy does the equipment need? The maximum energy load used by Green Farm is 30W. Won't the nearly constant work damage the LED module? The LED lighting module we installed in Green Farm was designed specifically to withstand the following cycle of daily work: 16 hours of "day-time" lighting mode – 8 hours of "night-time" lights off mode. User needs only to set the cycle starting point, but the basic operation time remains the same unless deliberately changed. What else (besides leafy greens) can I put in my Green Farm? I'm seldom at home on weekdays, and/or travel a lot. Can I still use Green Farm? Of course! Simply make sure, before leaving for a prolonged period of time, that there's plenty of water in the cultivation tank - a conveniently placed marker will inform you of its level. A full tank of water lasts for approximately 30 days (a little less with fully grown plants, or in the summer when the outside temperature rises). All in all, you should be able to forget about adding water for up to 2 weeks. What do I need to prepare to start planting? Apart from your ,b>Green Farm, all you need is your chosen packet of seeds, a bit of liquid or powdered fertilizer, a bowl, a jug-like pot easy to fill and empty, and cold tap water as the base of your hydroponic fluid. All types of leafy greens, such as variaties of lettuce or roquette, baby leaf vegetables (eg. spinach) and herbs (basil, mint, sage, thyme and so on). Do I have to choose the plants that are currently "in season"? Not unless you want to. Green Farm works with the same efficiency in every season, thanks to its independence from the outside weather conditions, which means you can plant and harvest any vegetables and herbs you want, at any time. Do I need to add water to the tank every day? If you top up the cultivation tank on the day you plant the seeds, it should last for approximately 4 weeks. Check the level of the control floater every once in a while, as the seedlings may require more water as they grow (or if the temprature in the room where you keep your Green Farm is rather high), to make sure when to add the next couple of litres of water. When should I exchange the sponges? Each sponge is supposed to support a plant from planting the seed until the harvest. It should then be disposed of (due to significant root growth), and when you start another cultivation cycle it should be done with a fresh set of sponges. Would the plants be alright if there's no direct sunlight in the room? Absolutely. The Green Farm LED module replaces the sunlight entirely. Can I turn the lights off in the room without damaging the plants? As the LED module provides exactly the right amount of light necessary for the plants to grow, there's no need to turn on any other lights in the room, unless you need to do so for other purposes. What should be the temperature inside the room where I put my Green Farm? Ideally, between 15 and 30 degrees Celsius. Any lower than that, and the seeds may not sprout - any higher, and it might be too hot and stuffy for them to grow properly. Can I put some soil inside my Green Farm set? Green Farm is made for hydroponic cultivation - that is, one that uses a liquid instead of the soil as the base for plants. If you're growing your own vegetables from the seed, you don't need to use any soil at all - but if you're using Green Farm for storing the pots with flowers and other plants, you can of course use them as they are, without getting rid of the soil. When can I start harvesting my crops? Baby leaves should be ready to eat after 2-3 weeks. The plants achieve their full size after approximately 4 weeks, but you can keep them growing for about 2 months if you prefer. How big will they grow? Well-grown seedlings should be about 20 cm tall. What should I do if the plants wither, rot or start showing sympthoms of sickness? If you're concerned by a piece of a single plant, simply cut off the problematic section. If a whole seedling looks suspicious, If the whole plant is affected, remove it together with the sponge, and close the remaining hole off with a cap provided. However, if most of the plants look sick, grow poor, wither or change colour, we'd suggest throwing away the sponges and seeds, washing the Green Farm set with warm water and soft detergent, and beginning from scratch. Will I have to remove some seedlings as they grow? Quite probably, you might have to. As you plant the seeds, we advise you to use as many as possible, in case some of them don't sprout, or grow too slowly. After a few days you will observe the growth rate of all the seeds: if some of them haven't sprouted, or seem weaker than most, you can remove them with tweezers, and (if it happens early on) replace the seeds with new ones. When can I start the harvest? Most users find that the plants have grown to their satisfaction approximately 4 weeks after planting the seeds. How do I harvest the vegetables? Slide the hydroponic panel and tank out of the case, and cut the desired amount of leaves with sharp kitchen scissors. Do I have to wash the vegetables before eating them? You can rinse them gently with tap water, but it's not necessary: this method of cultivation produces very clean plants. What do I do with the equipment after I've harvested all the plants? Turn your Green Farm off, wash the plastic parts with warm water and detergent (such as your regular washing liquid), and wipe the case with a soft cloth. When everything is once again clean and dry, you can start on another batch of vegetables. Can I reuse the sponges? No - there'll be too much root matter and leftover fertilizer particles left on them. Please use a new set on sponges when starting up a new round of cultivation. Green Farm - Your key to healthy food. I agree to processing my personal data by U-TEC Europe Sp. z o.o., with its registered seat at Kłobucka 23A, 02-699 Warsaw PL, and putting them into a database for the purpose of contact (including telephone contact), providing answers to my questions and forwarding commercial information (as per the Personal Data Protection Act dated 29 August 1997, Journal of Laws of 2002, No. 101, item 926 as amended). I agree to processing my personal data by U-TEC Europe Sp. z o.o. and its partner entities for marketing purposes. I agree to receiving commercial information from U-TEC Europe Sp. z o.o. and its partner entities via electronic mail.